The Eraserheads willrock as one cohesive unit anew on March 7 to finish off the band's reunion concert held last August 30, 2008. Titled the Final Set, the concert hopes to meet persistent public demand for aget-together as well as to provide a sense of closure to everyone involved inthe Eraserheads legend. The Eraserheads willreunite for the second time on March 7 to settle unfinished business followingthe abrupt finish of their highly successful reunion concert last August 30,2008 in Taguig. In a phone interviewwith QTV's news program News on Q,Diane Ventura, Eraserheads frontman Ely Buendia's partner and manager, confirmed that thephenomenal ‘90s local rock act will regroup anew in a concert dubbed as the Final Set. The venue and other details have yet to be revealed. MTV Philippines isreportedly handling production duties for the reunion sequel. "To the fans, I know I'mspeaking for the whole band when I say that they're looking forward to seeingyou on March 7. Part of history. See you there," Diane said in a short message. ONELAST HURRAY. Composed of Ely, Buddy Zabala, MarcusAdor, and Raimund Marasigan, the Eraserheads broke up in 2002 due to creative differences. The band's musical legacy grew exponentially since thefalling out until the four decided to stage a one-night reunion concert lastyear. Ely unfortunately experiencedchest pains and reportedly collapsed backstage after completing the band'sfirst set of 15 songs. The band was supposed to dish out 30 songschronicling the bulk of the quartet's entire catalog. The upcoming concert will serve as the continuation of the previous event where thousandsof fans gathered at the Bonifacio Global City Open Field to witness the rockspectacle. As the titlesuggests and as the band stated last year, the reunion concert is a gift to the fans for their tireless support long after theEraserheads ceased to exist as one creative unit. 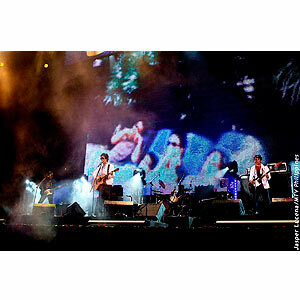 More importantly, the bandmembers hope that the concert would finally render closure to theentire Eraserheads saga.